We last visited Canajoharie in 2007, but I had been off the boat and missed the community named for a natural feature in the river. Today Canajoharie is marked by an enormous Beech Nut sign that reflects on the industry that helped build the community. The Arkell Museum and Library, an extraordinary cultural center just a short walk from the harbor, was established by the family that owned the company. The rest of the downtown seemed prosperous and interesting with the antique store getting visits from most of our crew, and the ice cream store which was also popular. 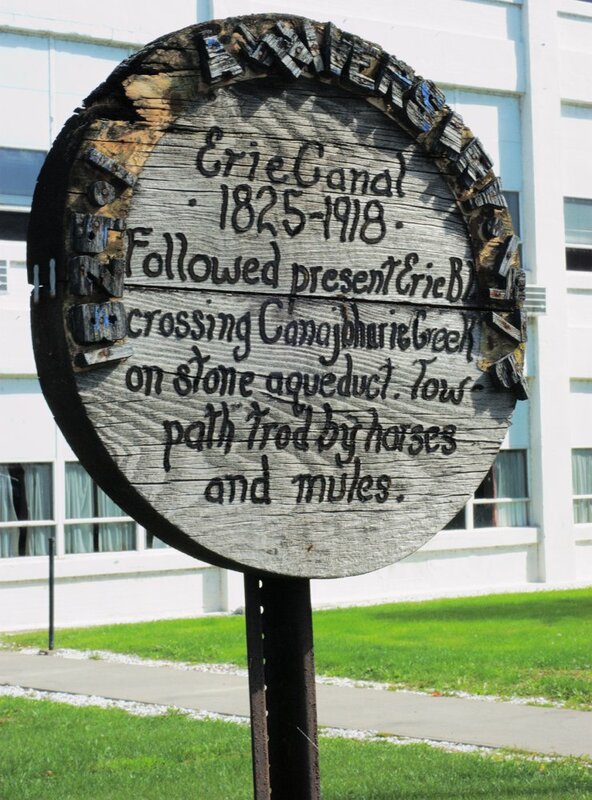 Like most downtowns along the present canal, the old [enlarged] Erie canal was now filled in and remembered by historic markers. We were very excited to be coming to Canajoharie where the community had arranged to enroll over 200 local students to participate in our educational programs. They were due to come aboard the next morning and our berth at the beautiful canal park made for the perfect location to receive them. We had a wonderful day for the school programs and the students and teachers were enthusiastic and timely. Our program has evolved from an effort to find the best ways to utilize the Lois McClure as a classroom and despite the intensive nature of the program, the crew all feels that we are delivering a lot of good, *curriculum-based information in a relatively short period of time. Most schools today have very limited field trip budgets and, on average, allocate about an hour of on-site time for the program. I’d like to offer a snapshot of the way the program is presented. Whether they come by bus or are close enough to be walked down to see us, we almost always hear the students before we see them. When the kids arrive, we gather the whole group to get an orientation to the history represented and the particulars about the way the time with us will be utilized. The role of the interconnected waterways in the settlement, military and commercial development of their town is given. The few rules about cooperation, raising hands, moving slowly and no running while on-board are presented. The group is then typically divided into 4-equal sized smaller groups and those groups are introduced to the crew member who then guides them to their first of the four stations. Each group will go to all four stations, just in a different sequence. The four stations are; the bow, where the group gets oriented to the working of the boat through examining the vessels anchors, the brakes. “Once this anchor that weighs more than you is over the side, how can we possibly get it back aboard?” The answer is the “windlass” which is a “complex machine” made up of several “simple machines” that give the crew-person “mechanical advantage”. Then, to their delight, each student has an opportunity for a hands on work experience with the windlass bars and “tailing” the anchor line until the slowly rising anchor is visible. This demonstration is always a big hit with the kids and really seems to make an impression. A second station is the stern, where the ships wheel is examined and a the discussion about how the boat works, As they examine our unique “shin- cracker” arrangement we reveal that the way we knew how to build it, as well as the rest of the boat, is from original shipwreck examples. The concept of “primary sources”, diaries, journals, letter and archaeological sites is explained. Here, with the students sitting on the cabin top, our crew-member will unfold the dramatic story of the 100-year December storm that sank the General Butler and the heroic rescue of Captain Montgomery, his daughter, her girlfriend and two others from the ice covered stones of the Burlington Breakwater by James Wakefield and his son Jack. Below decks are two more stations – the cargo hold where the freight carrying role of the canal boat is illustrated and the comparison is made to our modern 18-wheelers and finally the stern family cabin where the life of the family that ran the boat is discussed with the students asked to travel back in time an image life without electricity, computers, televisions and indoor plumbing. Each area has its storylines and lessons and students are encouraged to ask questions. Then, just as the station and its lessons are coming into focus, the bell rings, signaling to the crew and students that it is time to rotate to the next area. At the end of the visit, the orientation crew member will gather the groups back together off the boat to make some final observations and engage the group in further discussion. Final questions are presented and answered. We always close the program by informing the class about our public hours and invite them to return with family and friends when “they can be the tour guide.” It is always very validating to us when the kids return with their family or friends and we listen to their conversation. It never ceases to amaze me just how much information is passed through to the young students. While the program is intensive with each crew member required to give 4-mini lectures during the hour visit, its also very rewarding and why we take such pride in our program. We were graced with another random act of kindness in Canajoharie as well. Bill and Nancy Lyker stopped by the boat the evening before we left, and brought both culinary treats for the crew as well as a piece of history. Navigation buoys on the canal used to be fueled by kerosene, and refilled by buoy boats. 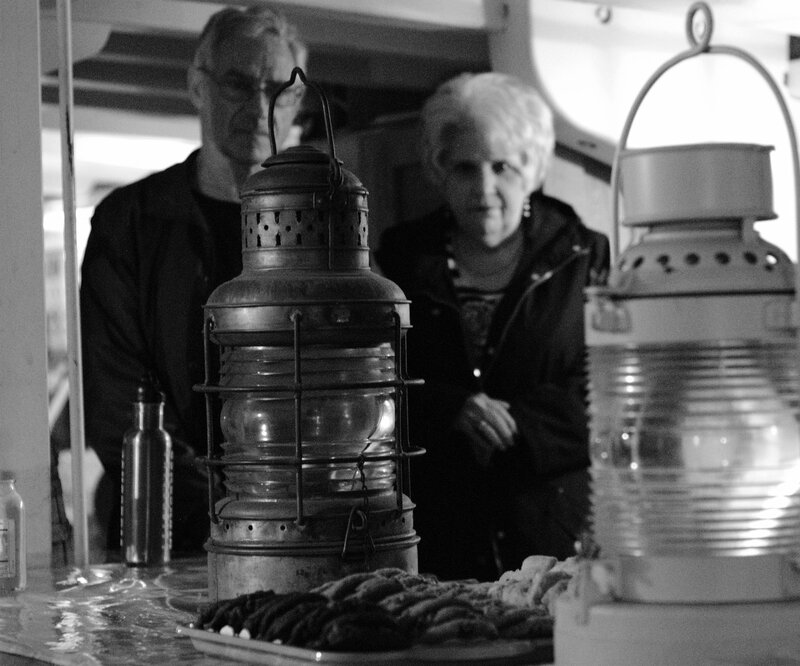 Along our travels, we had seen the little buoy tenders remaining from these days, but Bill and Nancy showed us for the first time the lanterns those boats were tending. The two lanterns they had really helped us reconnect to the canal era. Thank you both for sharing them with us. *Dr. Scott McLaughlin. Canalers Afloat: The Champlain Waterway’s Unique Maritime Community, 1819-1940. An Educational Curriculum for Grades PreK-8. Lake Champlain Maritime Museum, Volume 1&2. 2005. From Canajoharie we headed east to the Amsterdam waterfront. The wonderful park and harbor which has been developed on the canal waterfront is separated from the city by busy railroad tracks which could only be navigated by an overhead causeway. When we arrived and saw the logistics of getting to the waterfront, we were worried that although we were on an ideal park, we might be hard to see and reach by the public, and accordingly we anticipated a small crowd for our weekend program. The people of Amsterdam proved that their connection to history could overcome all that and we had an extraordinary turnout. The New York Canal Corporation, Congressman Paul Tonko, Mayor Thane and the Amsterdam Historical Society made our visit a catalyst for a larger history event. The Canal Corp brought the historic tug Grover Cleveland to share the wall with us and we were wonderfully surprised to see over 500 people in one day. But perhaps the best surprise was that many of the school students were had seen the previous week in Canajoharie came to Amsterdam with their parents, siblings and sometimes grandparents to explore the boat. Amsterdam turned out to be one of our most dynamic stops of the journey. The crew was able to explore the south side of the river where the old Erie Canal had passed through and see much remaining evidence of that era. As with all our stops, people went out of their way to make us feel welcome. Congressman Tonko and Mayor Thane each made us feel very much appreciated and we embarked to our next destination looking forward to the time when we will be able to return.